“The day after boxing day. The broken Supero-Constructo-Set fragments are thrown away. The only crackers left in the cracker tin are those horrid water biscuits. When Morag Narmo suggests to her mum on one boring Christmas break afternoon that her and the other four Narmo children would rather stick their head down a waste disposal unit than ‘do the academical’ she never expected her mum to agree. Two weeks later the whole Narmo family are embarking on a home-school experiment that is bound to show the true colours of all the family when chaos descends. This hilarious book shows just how the average family takes to home schooling and how Caitlin Moran came to be the woman we all know now. I haven’t read Caitlin Moran’s How To Be A Woman despite various friends telling me I must, but when I was offered her early novel, based loosely on her own upbringing, for review I knew I should give it a go and am I glad I did! The Chronicles of Narmo were are hilarious as I expected and are a brilliant introduction to the writer for anyone who hasn’t read ehr work before. Not much happens in The Chronicles of Narmo apart from the average day to day life of a chaotic family. I loved it because it was like my own family upbringing and probably like a lot of family environments. It captured perfectly the things that only those within the family get and understand and the way it flicked in and out of their life was fantastic. I loved the additions of various other views like that of the Gargoyles at the church where the family attend a cousin’s wedding and the slugs living in a can on the floor in front of the nearby council tower block. There isn’t much ‘story’, as such, in The Chronicles of Narmo because it is just life, and that is what makes it brilliant. I think quite possibly my favourite part of the whole book is the family holiday to Scotland because that stuff does happen, all the time. Its bound to rain whenever you are stuck in close confines with your family. The awe of the other campers from Bill, the Narmo dad, was brilliant and had me in histerics, as did various parts of the rest of the book. It was all so brilliantly captured. The Chronicles of Narmo was basic but brilliant and I think it will resonate with a lot of readers even though it does kind of show its age. I honestly don’t know any 15 year old who would act the way Morag does with their siblings now but I loved it all the same. The whole idea of Granny being named ‘The Bat’ and the family’s reaction when she arrived was fantastic, and the way Bill’s Very Important Business Meetings being held in the pub was brilliant. I really enjoyed this book and even though it was short it was brilliantly formed, as I say I think a lot of teens will recognise that the traits of Morag’s family and be able to link them with those of their own family. 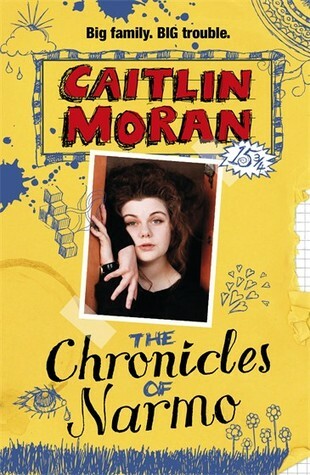 Definitely one for any fan of Caitlin Moran or anyone who, like me, has heard of the author, follows her on twitter, but hasn’t actually read her stuff. The Chronicles of Narmo was published in 1992 and republished on October 24th by Corgi. My copy was sent to me from the publisher in exchange for an honest review. I really want to read this, it sounds really funny and I’m interested that she wrote it when she was fifteen. Lovely review!